Kayaking is an all-year-round sport in Andalucia. 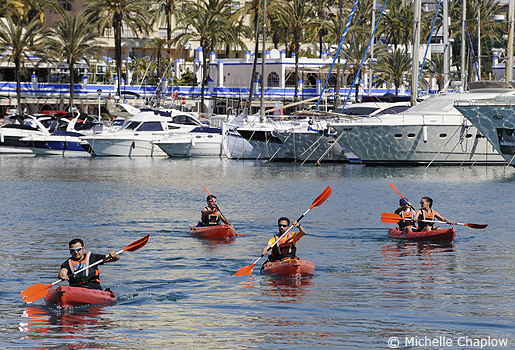 Kayaking and paddle-boarding are increasingly popular sports along the Andalucian coast. Kayaking is very similar to canoeing, except kayakers use a double-bladed paddle, whereas canoeists use a single-bladed paddle; and kayakers sit in their kayak, while canoeists sit or kneel in their boat. Paddle-boarding (also called surf de remo in Spanish) consists of lying or kneeling on a surfboard and moving the board by paddling. Another sport which is winning many fans is Stand-Up Paddle-boarding (SUP for short) which is described as a cross between canoeing and surfing, as it can be practised on waves; both sports originated in Hawaii. All of these boat/board and paddling options are great ways to explore the coast of Andalucia, with many companies offering supervised tours along particularly beautiful areas of shore, such as Isla Sancti Petri in Cadiz. Since 2006 Cabo de Gata kayak performing for thousands of people to enjoy our beaches, cliffs, marine reserves and contact with the natural environment that only this activity allows. It lasts about three hours and in this time activity includes a basic course to learn how to handle the canoe, and a stop at a cove for snorkeling (snorkeling), so shoveling time is approximately 2 hours. Departures are at 9.30 and at 16.30.